Today I have a few special small Christmas note cards to share with you. Why are they special? They are special because they have been stamped using just two stamps. And from a set you wouldn't associate with wreaths. So I made these wreaths with just a holly leaves stamp and the holly berries. So what is so special about that? Well I used the stamps from the Hang Your Stockings stamp set. When most people look at this set, they see stockings, fire places and those sort of things being made using it. The little holly leaves and berries are more like an extra add on to the stockings, and not normally thought of as the star of the card. But I had a crazy idea to see if I could make a wreath with them. To my amazement it worked really well. So I ended up making three 4" x 4" cards that used just the holly and berries stamps to create the wreaths. I created each wreath differently. Some I used two colours, some I used three colours for the leaves. Some I stamped off to create a more bushy filled in look. These were actually one of the projects in the November Stamping By Mail class. I hope all the class recipients enjoyed making them as much as I did. 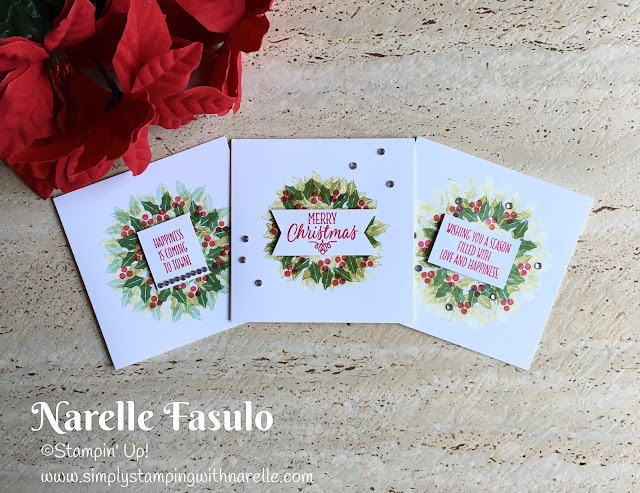 Registration for the current Stamping By Mail class will close this coming Saturday, 10th December. So if you want to join in the fun, them make sure you register today. You get the stamp set and matching framelits,plus 8 project kits with instructions, as well as access to exclusive videos and more. Read more here, but don't delay or you might miss out. If you want to recreate these cards, you will need the supplies listed below.